Uber’s thus far been looking to own the mobility space in India — it started with car taxis, moved on to bike taxis, and now even does food deliveries. But now there are indications that it’s eyeing yet another lucrative field — content. Uber’s app now shows relevant hyperlocal updates while customers take their rides. Scrolling down from the app, for instance, leads to this little article about upcoming movie Daddy. The short summary of the movie is powered by BookMyShow, and the snippet ends with a reminder to take an Uber to catch the movie. 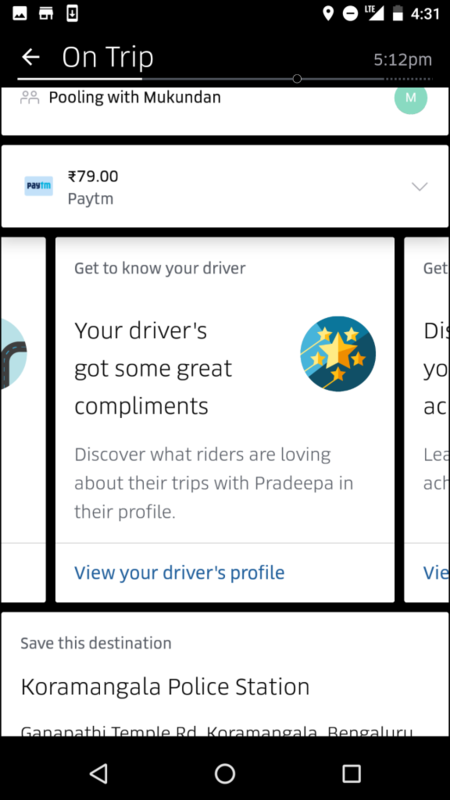 The app now also aims to connect passengers to their drivers. During rides, customers can know their drivers better, and get to see the number of total rides they’ve finished, and the compliments they’ve received from previous riders. 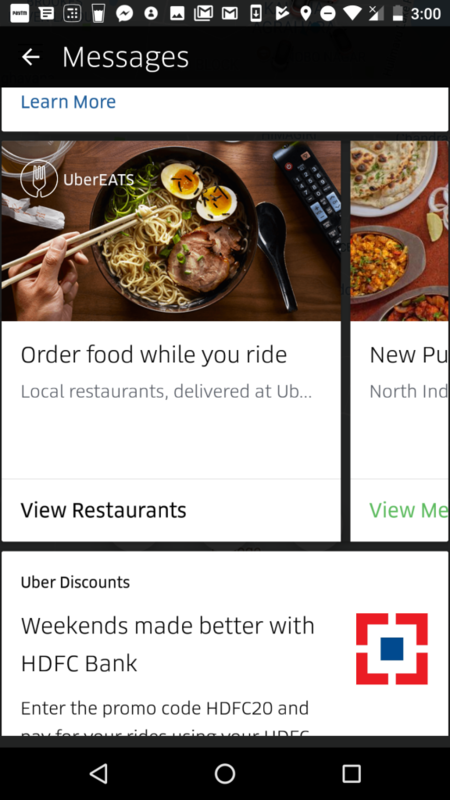 And finally, Uber is also promoting Uber Eats on its app. It was expected that Uber would use its cab-hailing popularity to promote its food delivery service, and it’s doing just that — customers on rides are shown the latest Uber Eats offers. These offers are hypertargeted, and seem relevant to where the users are. Uber’s recently claimed to complete 500 million rides in India. This means people have spent billions of minutes while on Uber rides, and many of them would’ve lazily browsed through their phones while in transit. With the Uber app open on phones just after booking the ride, it’s likely people go through it while on the move. And a mini, in-ride magazine might be a clever way to capitalize on these hours and hours of attention. Airlines have been doing this for decades with in-flight magazines, and Uber seems to be following much the same path. Uber’s mini magazine has useful articles, advertisements, and even helpful information about the company. Unlike airlines, which must serve the same magazines to all its users, Uber can tailor its offerings according to its users — users can be shown hyperlocal offers based on where they’re headed, and offers based on what they’ve previously shown interest in. And while thus far Uber has been promoting only its own services on the app, it doesn’t seem far-fetched to imagine how one day the app could carry third-party ads. Uber’s urban, upwardly mobile audience is a coveted target group for advertisers, and brands could pay a pretty premium to market their services through Uber. And Uber could charge for space on its app, thus opening up a new channel of income for the company. Ola is already working on something along similar lines. Its Prime service now has inbuilt screens within cars which carry popular content, such as sketches from AIB and popular music. The company has also attempted to use its reach to woo advertisers — it had partnered with the Transformers movie in India, and had turned the car icons on its app into Transformers during its promotion. And cab companies would do well to have an alternate source of income. Both Uber and Ola recorded losses running in thousands of crores last year, as they battled each other on one hand, and angry driver partners on the other. With money coming in from ads, Ola and Uber could help its driver partners earn larger incomes, reduce fares for its customers, and help themselves become financially viable. Even in the cab hailing industry, content might just prove to be king.